Today was another nice day for a walk around Barbour’s pond at Garret Mountain. Early in April the birds you will see can be estimated and hoped for, but you never know what has blown in or picked up and moved on. 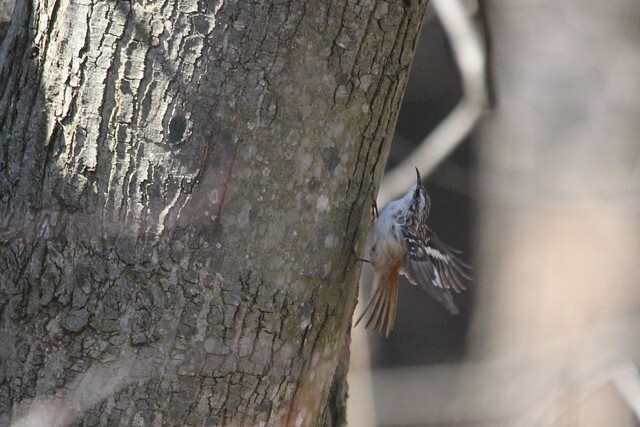 The last few days of March and the first week and a half are usually pretty consistent for Pine Warbler, Louisiana Waterthrush (first/second week of April), Winter Wren and Yellow-bellied Sapsucker and at the end of the run Palm Warblers. 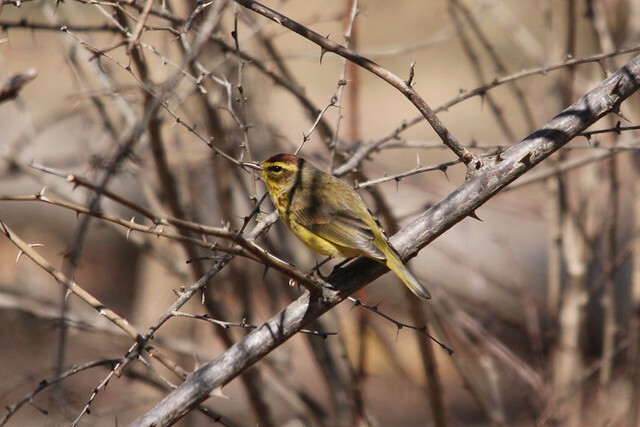 Lots of Palm Warblers. 🙂 It is rare for me to make multiple trips to Garret during this time period and not see some or all of these. It is always a nice feeling to hear the first Pine Warbler song, see the Mourning Cloak fluttering past and watch the first Waterthrush bob its tail picking through the steam’s edges. All feels right with the world when these timings we become used to play out as expected in front of us with no human intervention required (or desired for that matter). 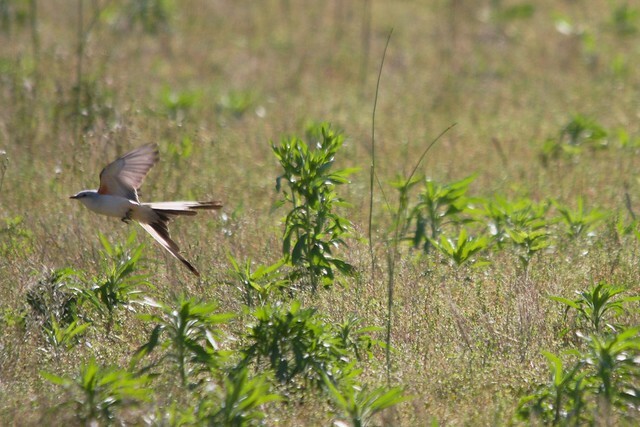 The second and third week of April usually bring in the next “wave” of migrants. This time is always interesting because an “early” member from the later groups can make guest appearances wetting your beak for the pending invasion you know sits waiting on waves of weather from the south. May is when those flood gates usually open, unleashing the traveling hordes through our borders. 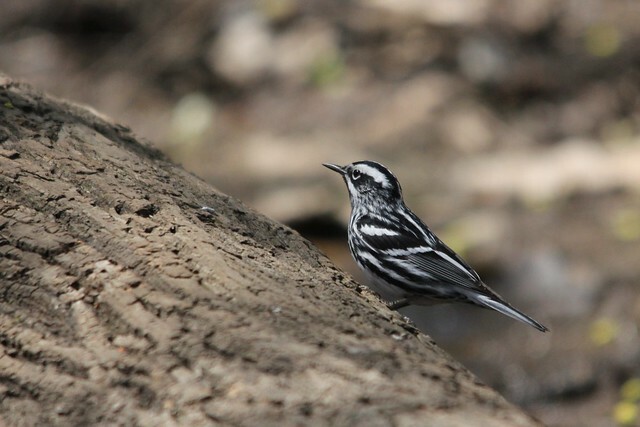 (happily mind you :)) So, the second and third weeks of April can bring Black-and-white Warbler, Blue-gray Gnatcatcher, Ovenbird, Yellow-rumped Warbler, Rusty Blackbird, Blue-headed Vireo, Lincoln’s Sparrow (uncommon), and circling Broad-winged Hawks. Near the end of the third week (20s and on) comes the opportunity for Northern Parula and Black-throated Green Warblers. 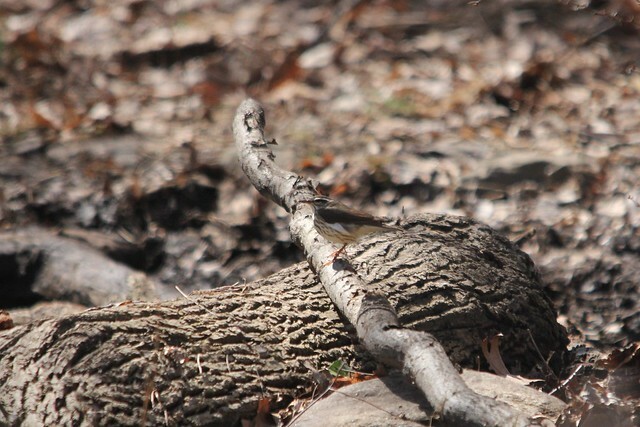 American Redstart is close behind as well. 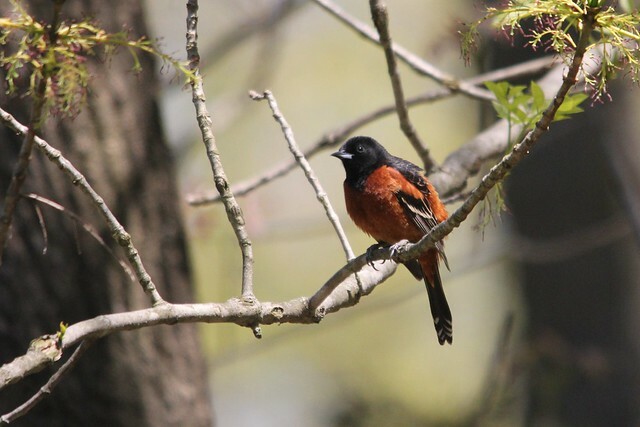 Orchard Oriole is also a bird that can make an early appearance at this time. 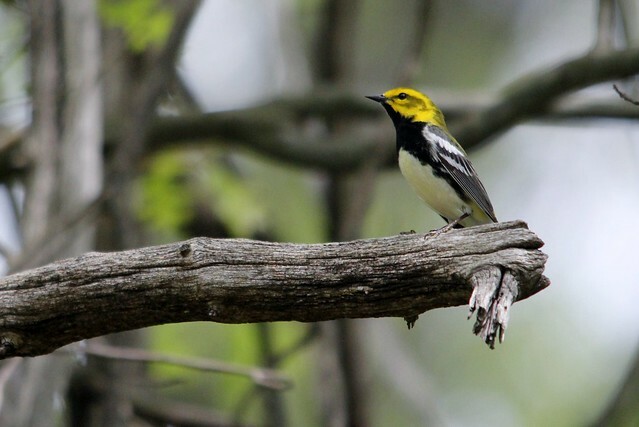 Soon, Black-throated Blue and Green Warblers will serenade your entrance at the top of the park on Early May Saturday mornings welcoming you to a day of wonderful migrants abound. 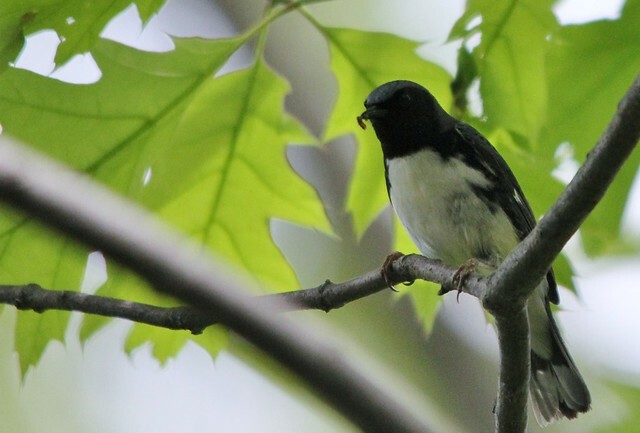 Orioles, Grosbeaks, Warblers, Vireos, Tanagers and Flycatchers scour the trees for inch worms and active bugs while eager Cuckoos pick through Tent caterpillars. It really is a wonderful time. So, the schedule is out there. Time has shown the migrator’s hand and its only up to us to show up and see it played! My favorite time of the year to be sure! 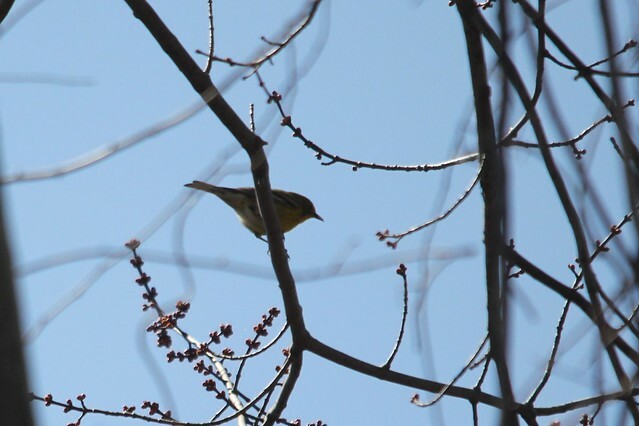 Fun facts: In looking at my photos of 2008-2014 here are a couple of the possible April early birds and their dates: Hooded Warbler, April 10th, 2010, Northern Parula – April 7th, 2011. Keep your eyes open and Good Birding! Ahhh Spring. For some time now it is been “technically” Spring, but it sure hasn’t felt like it. We are just getting through a very cold and long winter and it was a nice relief today to simply take a walk around Garret in a light coat and take in the sun. 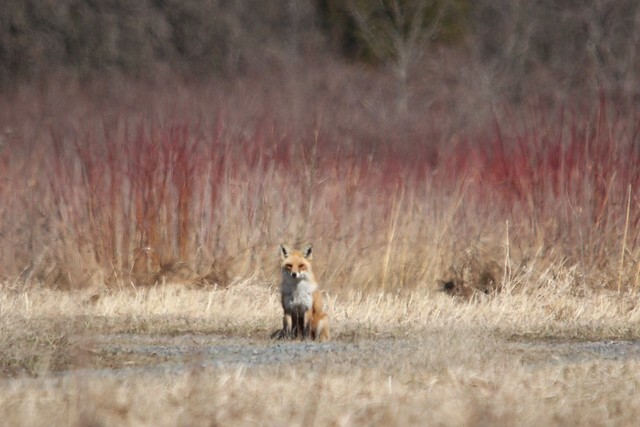 The first week of April is a great time at Garret to seek out some of the early Spring arrivals. 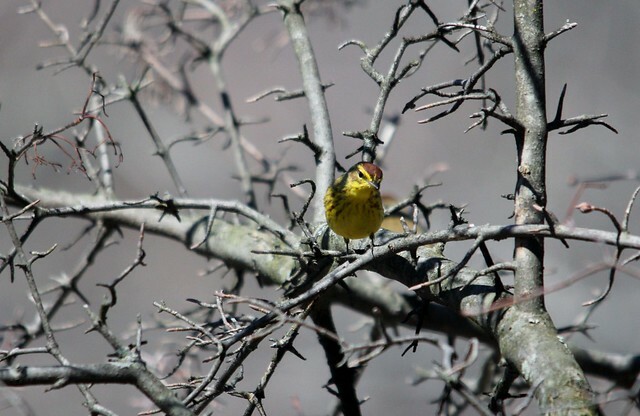 Pine Warbler, Winter Wren and Louisiana Waterthrush are some of my favorite birds and can be found precisely this time of year at Garret. I parked at the top of Wilson and had 2 of the 3 within the first 10 minutes of my walk. 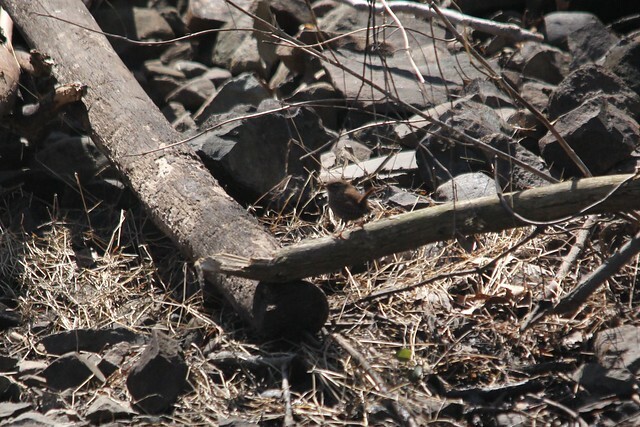 A Winter Wren popped out of a pile of broken logs and twigs (very Winter Wren appropriate!) and hopped along the stream’s edge at the bottom of Wilson. 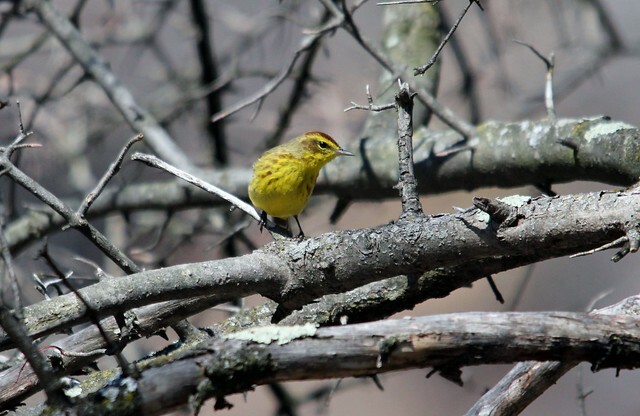 (We saw at least 3 Winter Wrens around Garret today) Then, a bright yellow male Pine Warbler came into my view testing my small movement periphery skills. 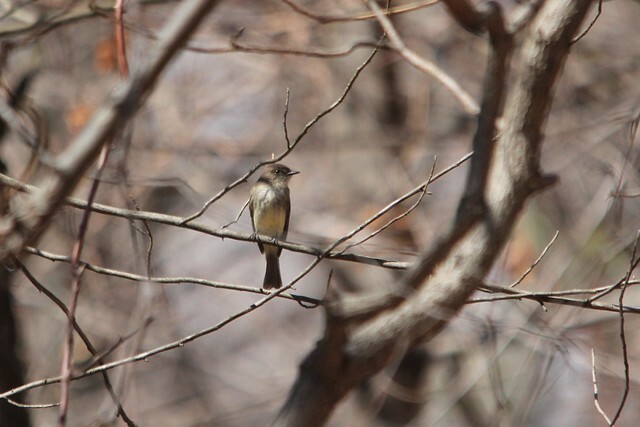 The bright yellow stood out, but the size compared to the many Golden-crowned Kinglets around also was telling. He didn’t call or sing at all so I will have to wait for my first Pine song of the year but I was happy with my first male (I had a female @ Charles H Rodgers in Princeton which was a FOS yesterday). The path on Wilson turned up more Golden-crowned Kinglets and a single Yellow-rumped Warbler and 2 Yellow-bellied Sapsuckers. We then headed down towards the stream behind the boat house hoping to see the regular Louisiana Waterthrush. Sure enough, not even yet onto the path one popped into view and began working the rocks and stream sides for food pumping its tail all the way. 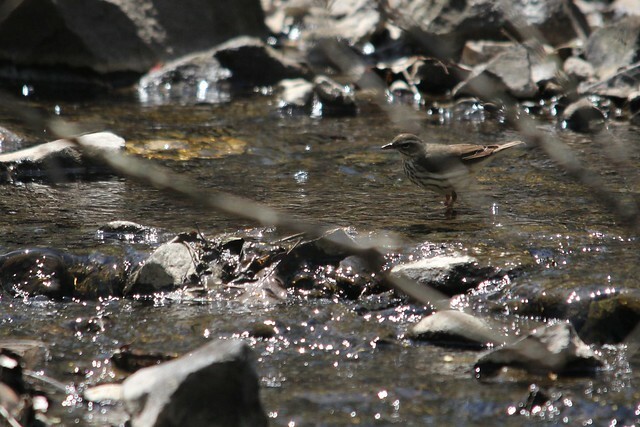 Its officially Spring once I see a Louisiana Waterthrush. 🙂 Awesome bird. There was also a Winter Wren here and more GC Kinglets. 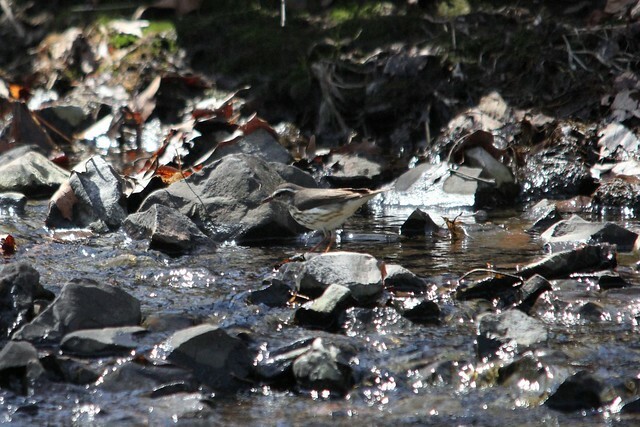 No Killdeer here yet for me and no Palm Warbler. We continued our walk and had 3 awesome (slightly later than normal) Fox Sparrows working with a flock of White-throated Sparrows and Dark-eyed Juncos. Pretty orangy, (yes that’s an official color description I made up :)) none of them were the deep brick red but they were a pleasure to see! 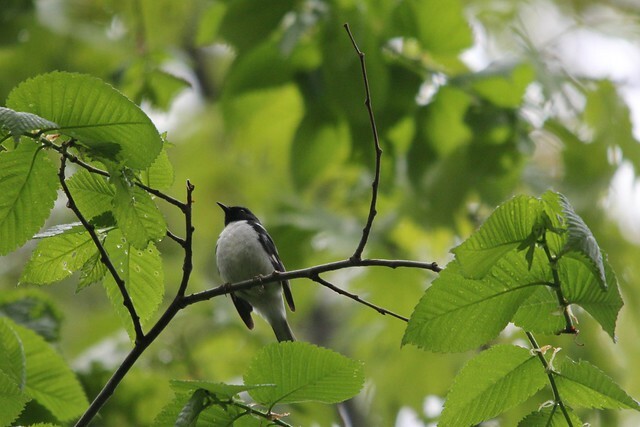 We also came across a pair of Eastern Phoebes on our walk past the picnic area and a first for me at Garret, a young male Red-headed Woodpecker! A nice start to the spring walks at Garret. 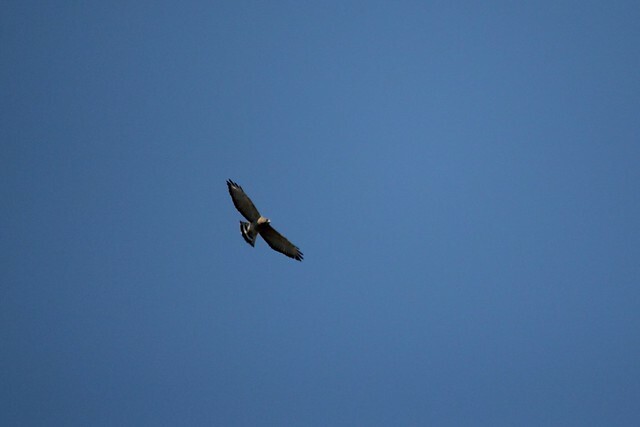 A really nice week of birding this week at Garret! 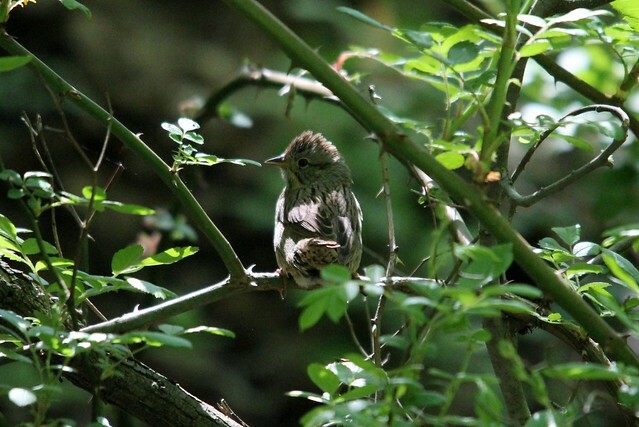 I had 26 different Warbler species and had Blackburnian, Bay-breasted, Blackpoll, and Cape May almost daily (in my experience these are all tough to get). Although not the big fallout days where birds were dripping off all the trees, there have been strong large flocks of birds that can be found and then identified. I am sure my improved song recognition has helped this year as many were found after hearing them sing and then tracking them down. 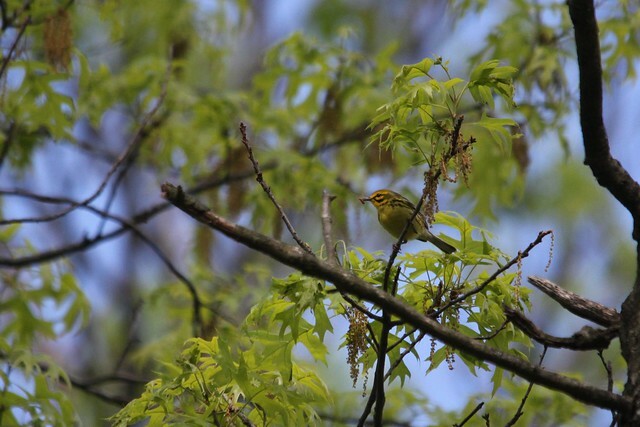 On Thursday, a pair of Wilson’s Warblers and finally a Lincoln’s Sparrow. 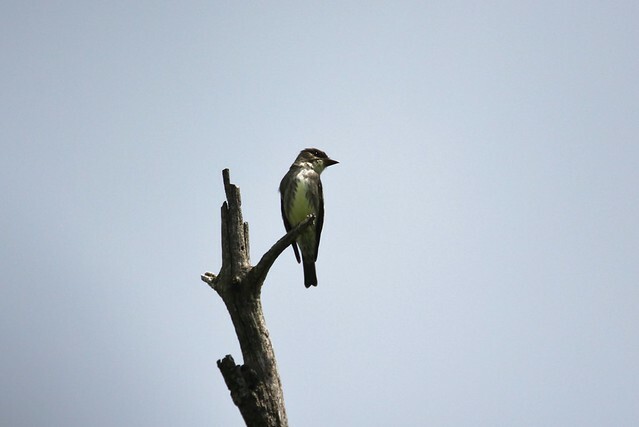 On Friday, nice looks at Tennessee and an Olive-sided Flycatcher! 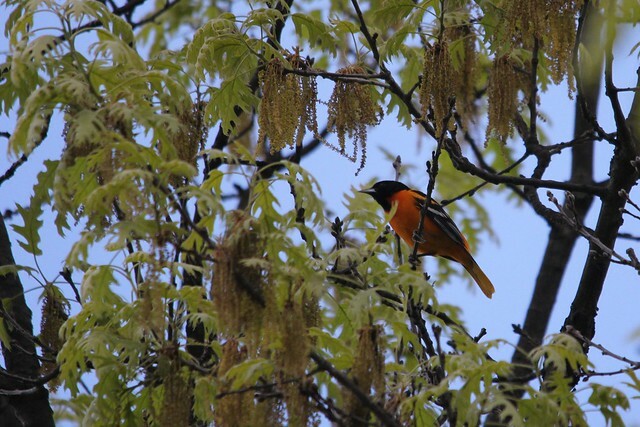 Always fun seeing the birds and birders at Garret in the Spring! 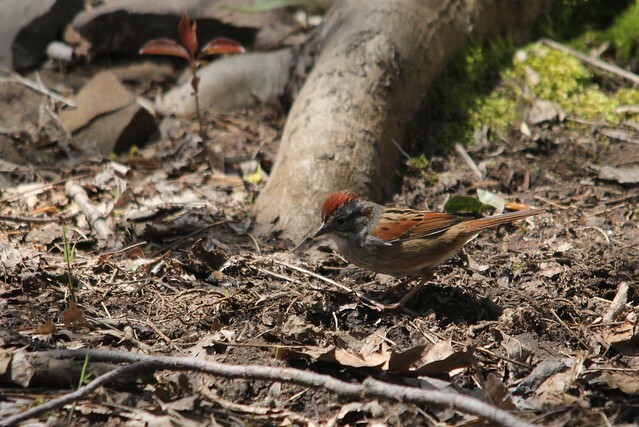 Also, at the end of this post I am including a map of Garret with suggested birding routes for people new to the park. I know I would have like to have this information starting out as the big park can be frustrating when the part you are at is quite yet people keep reporting great birds! Just keep on moving along through the park and you are bound to come across singing flocks. 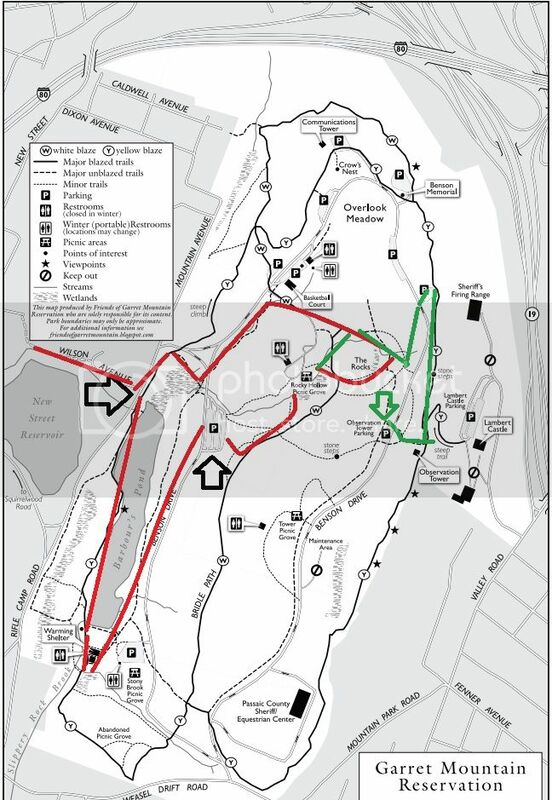 The green, haphazardly done lines are for morning (I like to start at the top of Garret if you are there early) and then the red if you get there in the mid-day or afternoon. Of course it is always variable and any part of the park can be amazing but this is based on my experience and the places I like to bird. I will put up another post next week with a final list of the Garret birds seen. For today just some pictures from the week and the map. Good Spring Birding All! More Pics at our Flickr Site! Magnolia WarblerYou know its a good day of birding when you get home and still hear bird song in your head. 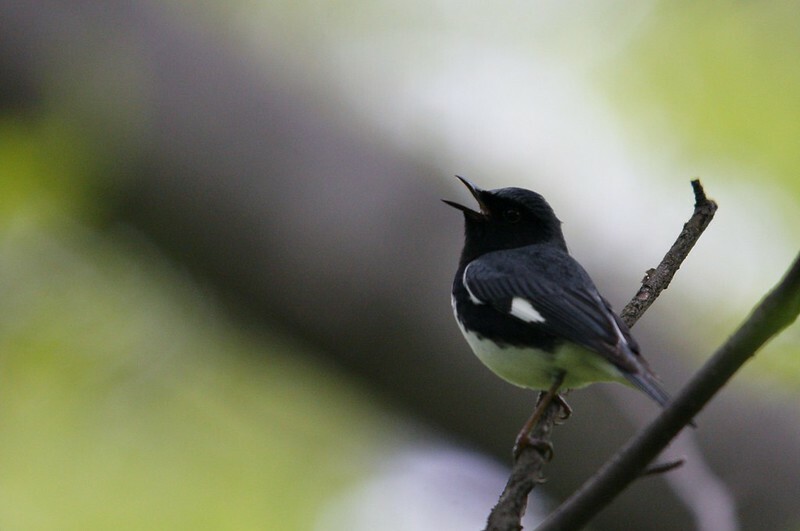 I was watching the Rangers swearing there was a Black-throated Blue Warbler at the game. Anyways, it was another good day at Garret! 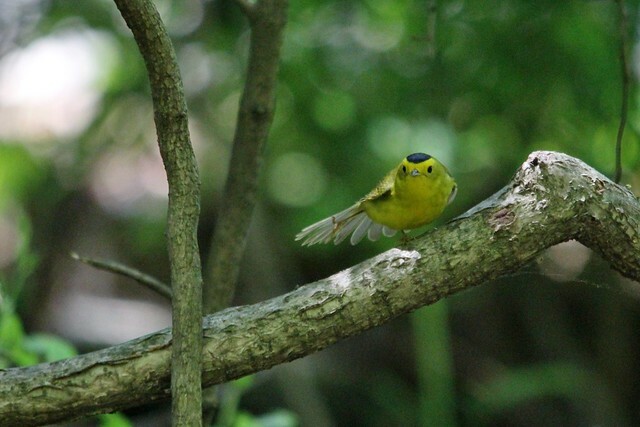 17 Warbler species and 4 Vireo! 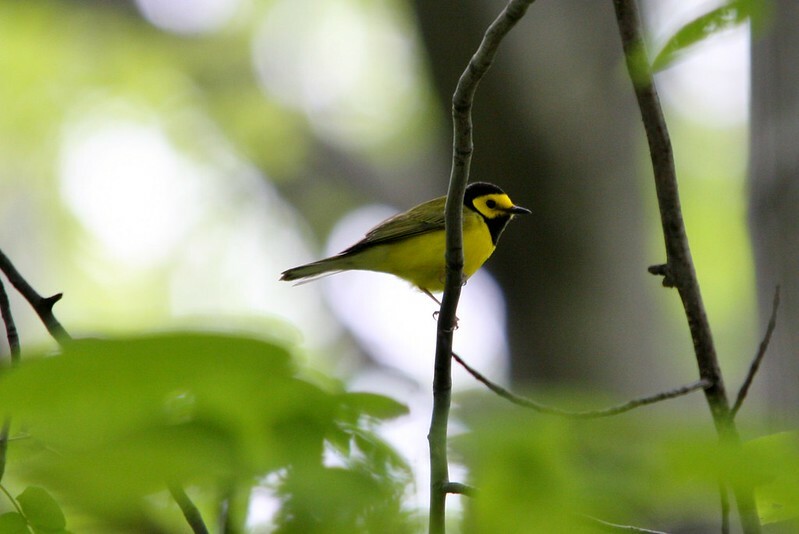 Picked up a singing Hooded Warbler 2 calling Blue-winged Warbler and multiple Magnolia Warbler that I didn’t see yesterday. 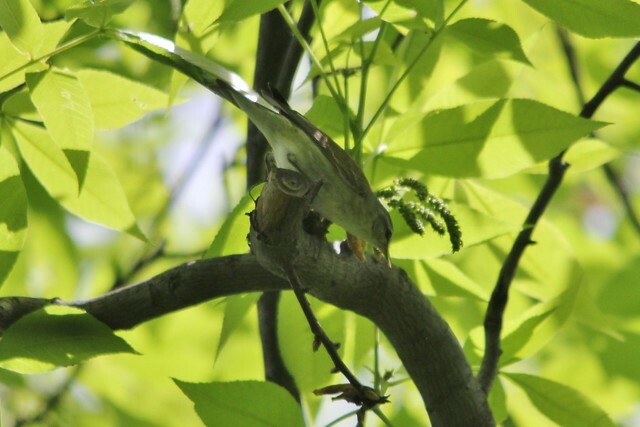 It must have been picture day because there was an amazing Magnolia on Wilson who wanted his picture taken and a super cooperative Black-throated Green Warbler near the pond where the Warbling Vireo and Blue-gray Gnatcatchers hang out. My favorites of the day were two towards the end of the day in a single Bay-breasted Warbler (on the hill on Wilson) and a Yellow-throated Vireo (behind the Boat House building on the pond up the stream a ways). 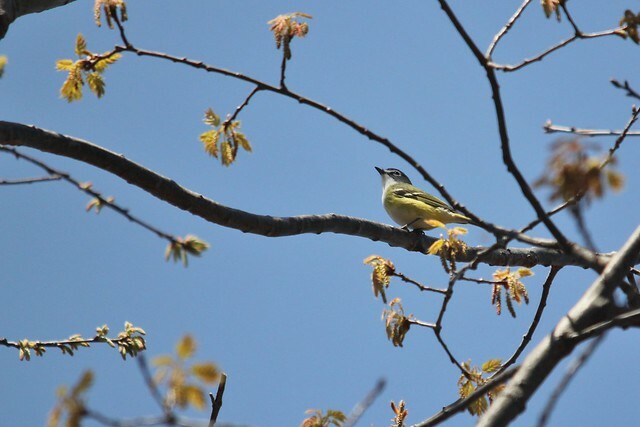 If the weather holds it should be another good day for the World Series of Birding at Garret! Will probably see many teams starting there tomorrow morning. 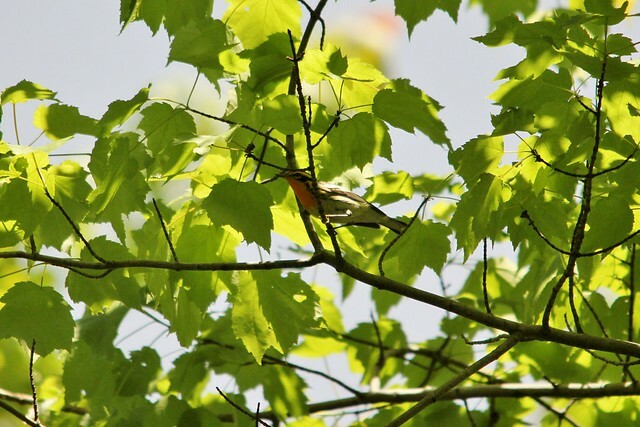 Nashville Warbler (1), Blue-winged Warbler (2), Chestnut-sided Warbler (1), Northern Parula (10+), Yellow Warbler (2), Prairie Warbler (1), Palm Warbler (1), Magnolia Warbler (4), Yellow-rumped Warbler (10+), Black-throated Green Warbler (10+), Black-throated Blue Warbler (10+), Bay-breasted Warbler (1), Blackpoll Warbler (1), Black-and-white Warbler (10+), American Redstart (10+), Common Yellowthroat (5+) , Ovenbird (10+), Hooded Warbler (1). 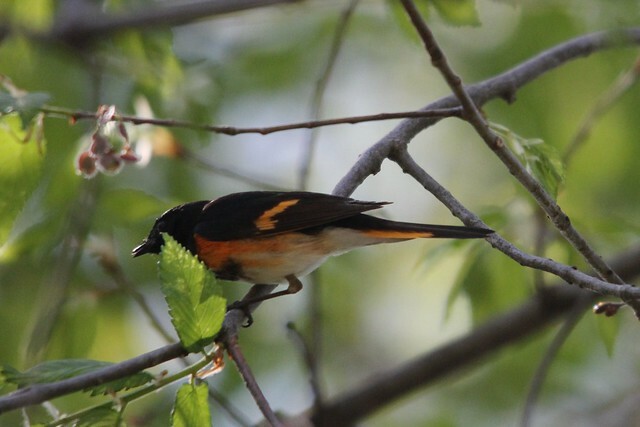 Both Baltimore and Orchard Oriole, Scarlet Tanager and Rose-breasted Grosbeak. Many Veery and Wood Thrush a single Swainson’s Thrush. Black-throated Blue WarblerI was optimistic even with the possibility of rain. It has been so slow I had reserved to bird from the car if need be to finally get a look at some new travelers! Not long did I wait as I drove into Garret. Blackpoll WarblerI like entering the park at the high side and then driving down and around the mountain, listening for the participants that may be in store for the day. For the last week and a half I was met with Robins and a whole lot of silence on this drive in. Today was different (admittedly the build up here is a bit theatrical but its two weeks late! :)), and I heard Black-throated Green Warbler and Northern Parula along with Baltimore Orioles welcoming me in. YES. I started out on Wilson Ave to a huge flock of birds that were on the slope at the end of the main road. 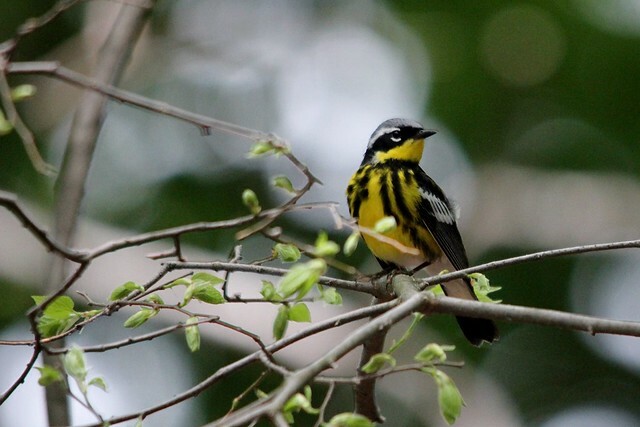 I heard Black-throated Blue Warblers and more Parula and many Ovenbird. 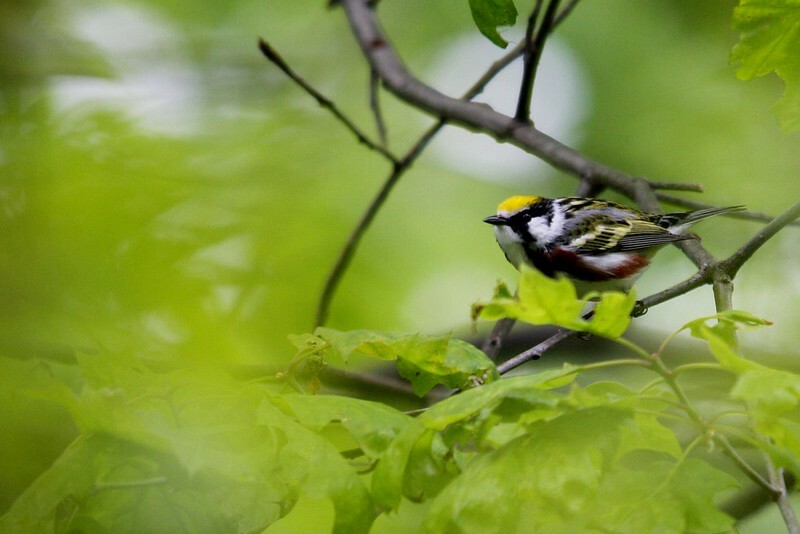 I got on the Blues and the aforementioned Black-throated Green Warblers along with a surprising multiple Blackpoll Warblers (usually a later warbler, but with this years pattern tough to say) singing away. 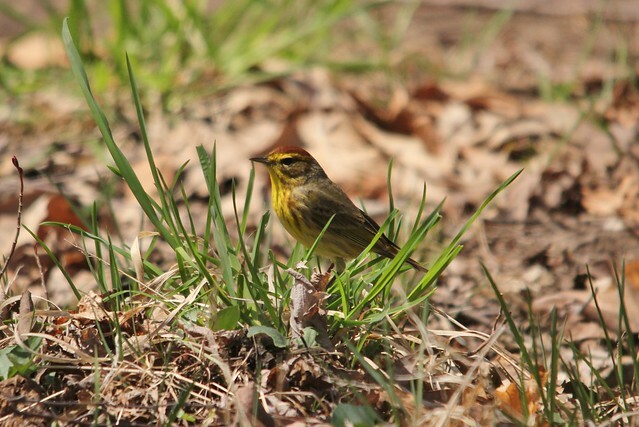 Palm Warbler, Black-and-White Warbler, Yellow-rumped Warbler, American Redstart and Yellow Warblers were present here. 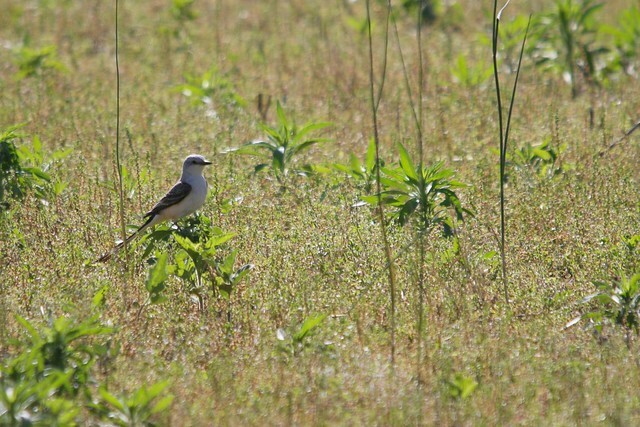 Prairie WarblerThe rest of the walk around Garret was full of birds with the Baltimore Orioles in in force and a pair of Orchard Orioles. We had Scarlet Tanagers and Great-crested Flycatchers and the pond held a Yellowlegs a Spotted Sandpiper and a Solitary Sandpiper. The resident Killdeer parents ushered around 4 babies that escaped all the water and the Common Yellowthroat seemed just fine with the conditions. (Mostly males only 1 female seen all day). 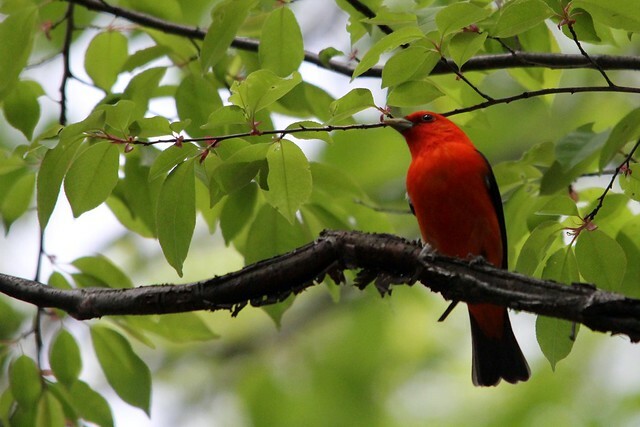 Further up above the tiered lot we had multiple male Scarlet Tanagers and the GC Flycatcher along with my only Chestnut-sided Warbler of the day and a Nashville Warbler. A final pass around Barbours pond produced a single male Prairie Warbler along with more Veery and Wood Thrush also moving in heavier. Notable misses were no Rose-breasted Grosbeak for me (other reported) and no Northern Waterthrush (others had) or Magnolia Warbler which would be expected. I am sure they will be soon found in the days to come as the weather should keep the park busy and the weekends forecast looks bright. My favorite time of year has arrived and although late, as the saying goes, better late than never! Nice grouping of the usual’s for this time. 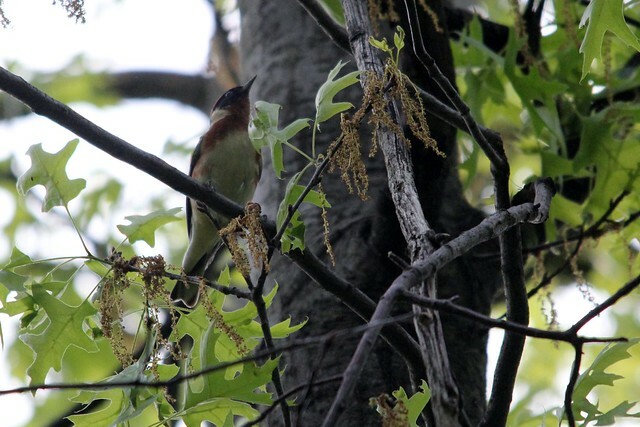 I had two Blue-headed Vireo and a number of Palm, Yellow-rumped and Black-and-White Warblers and heard an Ovenbird. 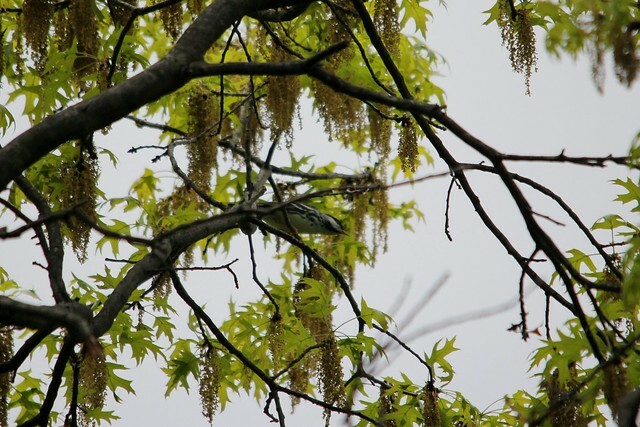 There were reports of Black-throated Green that I did not see. 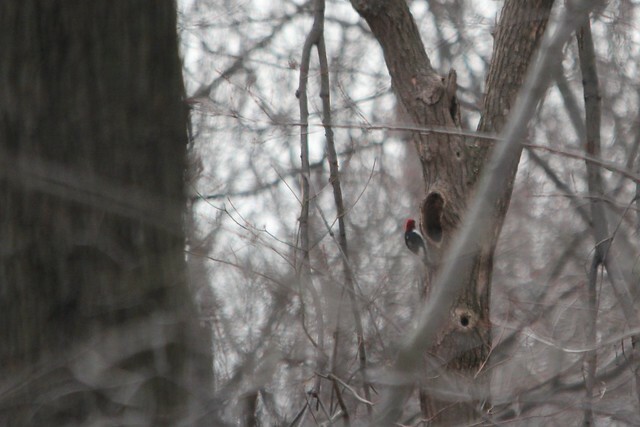 Winter Wren, Blue-grey Gnatcatcher, Ruby-crowned Kinglet and a Pileated Woodpecker were also seen. Over the next 14 days Garret Mounting will turn into migration super highway and this calm before the storm is exciting! My absolute favorite migration trap in New Jersey in the Spring! Happy its back again. Went down for the reported Tufted Duck and was not disappointed. The duck was easily visible from the path that circles it although the lighting made viewing tough at some points. 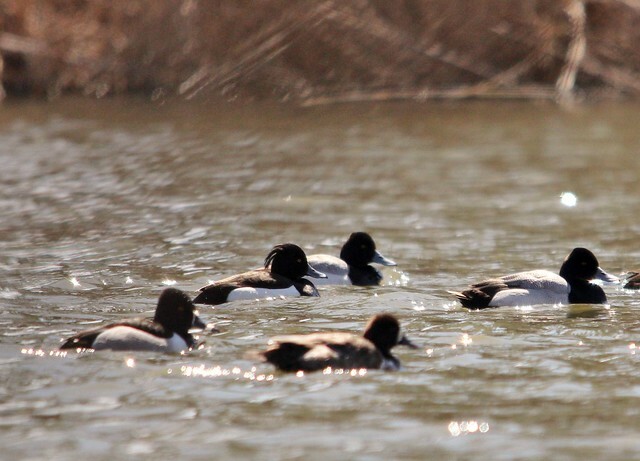 My interpretation throughout was the Tuft was obvious and the all white flanks separated it from the surrounding Ducks. It seemed to me to sit a little lower in the water too. Awesome bird!